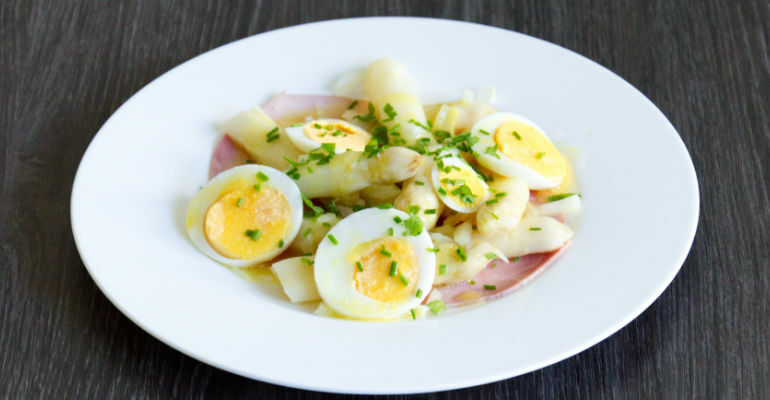 White Asparagus Salad with Ham and Boiled Egg Recipe - 3 traditional German white aspargus recipes with a video! White asparagus salad is extremely delicious! This white asparagus season I wanted to try new white asparagus dish. 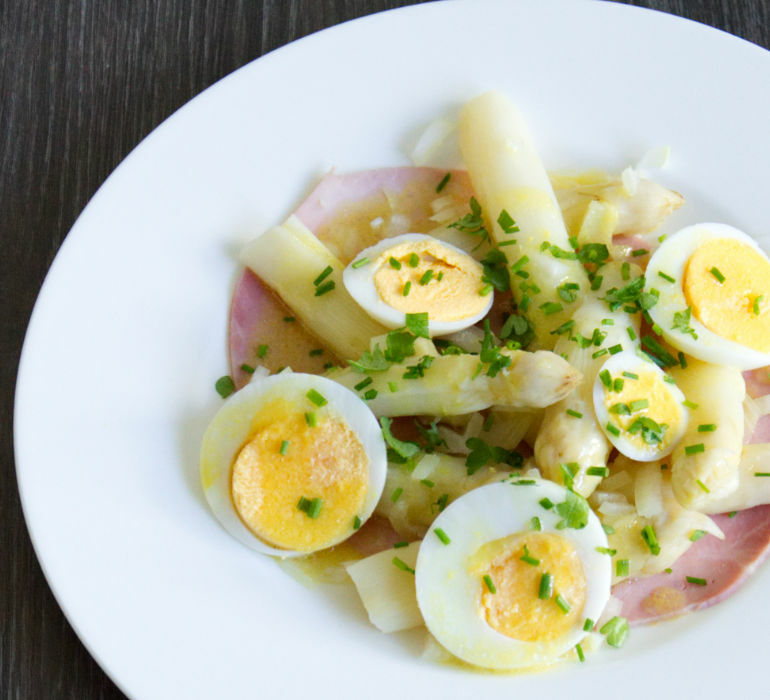 Every year I enjoy White Asparagus with Boiled Potatoes, Ham and Sauce Hollandaise or White Asparagus Soup, but I have never tried White Asparagus Salad. I think that is also my husband’s fault because he believes that there is no way that white asparagus can go well with vinegar. But he is not right! I found a recipe in which the dressing is not too dominant, and it does not overwhelm the dish. You can still taste this delicious white asparagus! The White Asparagus Salad can be served as a starter or with boiled potatoes as a main dish. It’s light and easy to make, especially when you have some white asparagus left! In the large pot pour the water and add salt, sugar, wine and, asparagus. Bring it to boil and cook over medium-low heat for 8-10 minutes. Get it from the water and set aside. Take a medium bowl and add vinegar, salt, suga, and mustard in it. Combine the ingredients. Pour oil slowly over it making sure that the ingredients combine. At the end add onion and set aside. In the medium bowl mix very gently asparagus, eggs and, salad dressing. Put the bowl in the fridge for at least 1 hour before serving. Take a small plate and put ham slice in the middle. Add very carefully few spoons of asparagus salad on the top. Garnish with fresh, chopped parsley and chives.